With the generous support of the Ontario Trillium Foundation, The Royal Conservatory’s Living Through the Arts Program has initiated the ARTS-REHAB Project: a multi-year initiative that examines how meaningful engagement in a creative arts program can assist rehab patients to re-enter their communities sooner and more positively than under standard treatment regimes. The ARTS-REHAB Project takes a whole-person approach to recovery by engaging specially-trained Artist-Facilitators to work with slow-stream rehabilitation patients in exploring themes such as: new personal stories & identities; sense of purpose; and positive images of the future. These Artist-Facilitators work in partnership with staff at six Ontario hospitals for a period of 3-4 months each, delivering weekly sessions for a group of patients who are also undertaking a traditional rehab recovery program. By the end of the project cycle, in Fall 2017, the ARTS-REHAB Project will have positively impacted the lives of hundreds of patients, while also validating a new approach to whole-person recovery treatment that can be adopted by hospitals across the province, throughout Canada, and even around the world. To work collaboratively in teams that include: RCM Project Leaders, Researchers, Artist-Facilitators and eight Ontario hospital partners. To guide a creative process and follow a new curriculum that fosters the development of new stories and identities, a new sense of purpose, and positive images of the future. To evaluate the impact of the Arts on patient engagement, optimism, and length of recovery and hospital stay. Photo at top of page: Hospital staff clinicians from Bridgepoint Active Healthcare participating in an ARTS-REHAB demo session led by Artist-Facilitator Jennifer Polo. 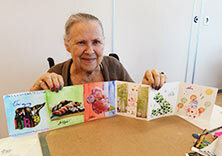 A participant at Bridgepoint Active Healthcare displaying her “Journey Book” created in an ARTS-REHAB session led by Artist-Facilitator Jennifer Polo. Central to the ARTS-REHAB Project is a major research study, led by Dr. Lisa Meschino, that seeks to answer the question: How can meaningful engagement in a creative arts program impact the personal and social wellness of patients in rehabilitation? 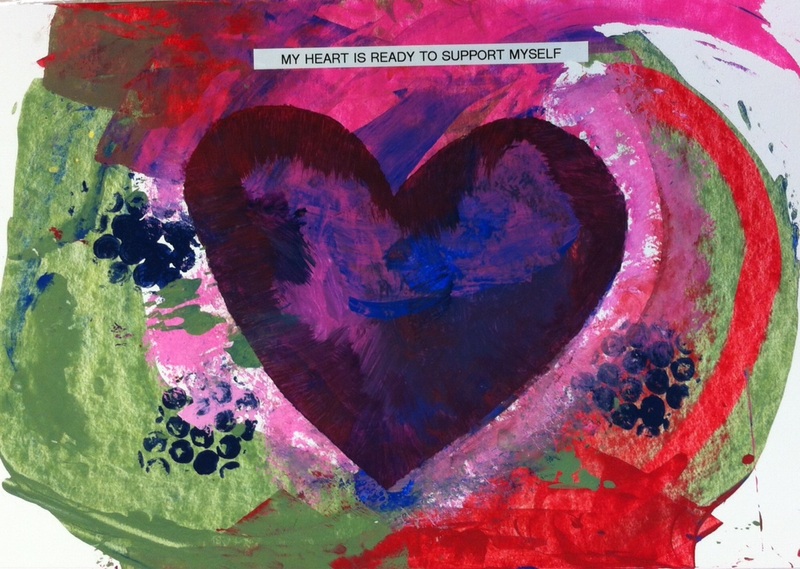 The ARTS-REHAB Project aims to describe and interpret the expectations and experiences of patients’ evolving sense of self in recovery as informed by their participation in the Living Through the Arts program which is designed to empower individuals and communities through artistic self-expression and creativity. Each art form used in the project (i.e. visual arts, music, drama, creative movement, creative writing) is facilitated back-to-back in 3-to-4-month periods for the duration of the study. For those patients receiving this arts intervention in addition to their rehabilitation activities, we expect to see a difference in the following primary measures: an increase in patients’ sense of hope, optimism and future purpose; an increase in patients’ engagement in their rehabilitation; and a decrease in their hospital length of stay. Our team has been reflecting on the process of developing a program that fosters social wellness, as well as its related evaluative research study, and they have identified some key aspects associated with the success of the ARTS-REHAB Project to date. Hospitals acknowledge a need for rehab programs that focus on the wellbeing of the whole person, not just the physical. Processes are set up to build rapport between the arts world and the medical world. Project partners draw a link between arts programs, patient engagement, and standard rehabilitation recovery regime. 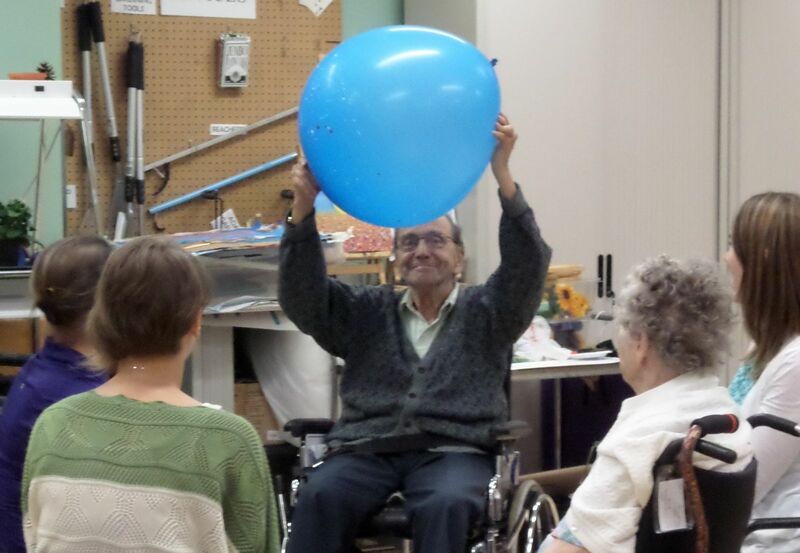 Patients in slow-stream rehab have the greatest need for meaningful activity. The program model must be adaptable to hospitals’ diverse processes, protocols, staffing, and available programming.